In the second episode of Jason of Star Command’s second season, “Frozen in Space,” Jason (Craig Littler) and his new friend, the amnesiac alien, Samantha (Tamara Dobson), head to a small planetoid that appears to be the source of a deadly freezing beam. On the surface of the inhospitable planetoid, Jason and Samantha meet “Tehor,” a monstrous minion of Dragos who is responsible for controlling the freeze beam. Realizing that she may be Star Command’s last chance for survival, Samantha pretends to be an ally to Tehor and Dragos, and betrays Jason. 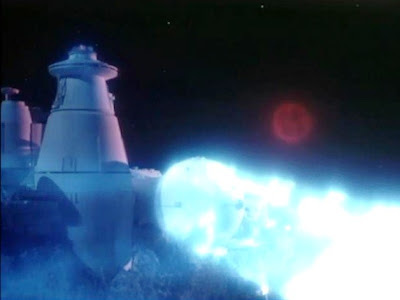 In reality, her actions are an excuse to get the duo into the base and to the all-important freeze beam control system. Straight-forward and to-the-point “Frozen in Space” by Margaret Armen is buttressed by some outstanding special effects work, and a dramatic through-line that is actually pretty impressive in terms of children’s television. In the case of the former, “Frozen in Space” features some dynamic miniature shots of Star Command under the burning shadow of a giant dwarf star. There’s also a terrific composition here involving Jason’s Star Fire descending to the planetoid surface. On the latter front, we get the newest chapter in Samantha’s on-going attempt to discover her own mysterious origin…and nature. She wonders aloud: “what if my people are evil?” Samantha wonders too, if she might be evil, on a personal basis. Jason’s encouraging reply suggests that she can be whom she chooses to be. In that answer, one can detect how a good message is being transmitted to the kiddies out there in TV land. It’s not too heavy-handed, but Samantha’s plight reminds the viewer that people should be judged by the content of their character, not by stereotypes or other external factors which may not truly consider the measure of a man, or woman. Other than the nice character development about Samantha proving to herself she is not evil in nature, “Frozen in Space” is a pretty rudimentary narrative affair with captures, escapes, and more captures. My friend Mateo Latosa, editor at Powys Media, calls this brand of story a “run around.” The characters run lots of places, rescue each other, get captured, and then defeat the villain…but not much meaningful actually happens. The pure movement and busy-ness of the enterprise distracts you from the thematic emptiness. The original Dr. Who, in the early years, did a lot of these “runaround” stories, and after a while they certainly grow tiresome. Here, Jason of Star Command seems more obsessed with action than interesting sci-fi storytelling: Jason smashes the freeze beam control panel by throwing a chair at it! Not exactly a high-minded solution, though it certainly gets the job done. Besides the narrative’s general lack of ingenuity, “Frozen in Space” features quite possibly the slowest, worst-aimed paralysis beam in TV history. Samantha and Jason (and WiKi) all attempt to avoid the ray, yet somehow manage to outrun and pivot around the bloody thing. Dragos needs to upgrade his technology or something. Probably the biggest disappointment of the week is that Jason and Commander Stone don’t get to interact, and continue their contentious process of coming to understand one another. Stone is trapped on Star Command with Parsafoot, and Jason is away on the planet, so there aren’t many character fireworks. Next episode: "Web of the Star Witch!" In last week's review, you stated that you considered 'Jason' to be more 'Star Wars' than 'Star Trek'. Ironically, this episode was written by Margaret Armen who wrote 3 episodes of classic Trek as well as 2 episodes of animated Trek (and some 'Land of the Lost'). Some of this ep's plot seem to have been dictatated by the regulations for saturday morning tv. When Samantha is captured by Tehor's creatures, she puts up very little resistance. That seems to contradict the last week's episode where she showed such super strength. Was the writer told to avoid 'violent' fights between characters? Later, Samantha reveals that exercising that strength 'drains' her (so there could be some justification for her easy capture). Some spectacular effects open the show. 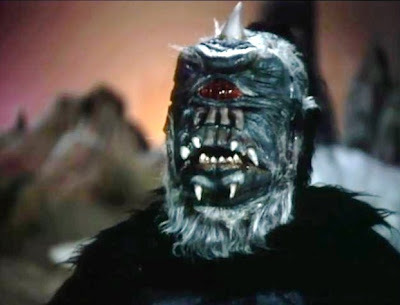 The back-lit animation 'freeze-ray' is especially impressive compared to the cheap video effects used in the live-action Krofft shows of the era. I had watched some of the Krofft shows (on the 'Sid and Marty Krofft Saturday Morning Hits' DVD) before looking at this ep of 'Jason'. Sid Haig appeared in an ep of 'Elektra Woman'. His acting in JOSC seems tasteful and understated compared to his outrageous and over the top acting in the Krofft show. In fact, almost all of the acting in 'Jason' is understated compared to the acting in some of the Krofft shows. Professor Parsafoot's 'goofiness' irritated me as a kid, but seems less irritating now. Tehor and the other creatures are definately less impressive now. When the show first aired, they looked fairly cool (as did 'Dr Who's and 'Space:1999's year 2 creatures). I did have some appreciation for the effort put in to make them. The first issue of Fangoria magazine featured a nice article on the making of these JOSC creatures. 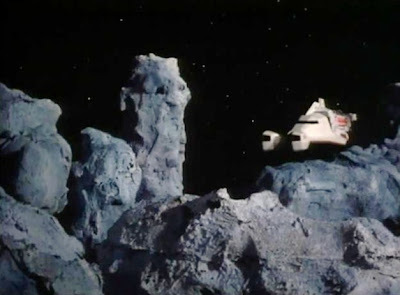 The lighting in the sets for the the asteriod should have been more careful. The painted mountain flats cast very distracting shadows on the 'sky' background (this might have been unavoidable given the very small size of the sets). In closing, this ep is a mixed bag. I'm really enjoying your weekly reviews for 'Jason' and 'Fantastic Journey'. As always, John. Another excellent review of a classic science fiction saga. Keep up the good work.